Here is an easy, healthful dinner for a cold January evening — actually you can make all the vegetables and the apple compote ahead — and just roast the pork at the last minute — Bon Appetit! Place the olive oil and the onion in a medium-size saute pan over medium high heat. Cook for about 20 minutes, stirring occasionally, until the onions are golden. Add the balsamic vinegar, sherry vinegar, with salt and pepper to taste and cook another few minutes. Add the apples, with the ground ginger, ground allspice and whole mustard seeds. Cook another 10 to 15 minutes. Set aside. Trim the silver skin and any fat from the pork tenderloins. Tie them at one-inch intervals. Season them with salt and pepper. Place them in a roasting pan in a 375 degree oven and roast until a thermometer inserted in the middle of the meat reads 150 degrees, about 20 minutes. Remove the meat from the oven and let rest 5 minutes. Remove the strings. Add the chicken stock to the roasting pan and boil it. Add the onion-apple mixture and cook, stirring, 3 to 4 minutes. Taste and add salt and pepper to taste. 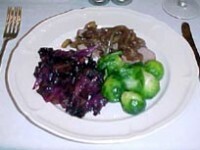 Slice the pork into 3/4 inch rounds, and serve covered with the apple-onion mixture. Sprinkle with parsley. In a large frying pan cook the onions in the butter over medium-high heat with a sprinkling of salt for about 5 minutes until the onions are soft. 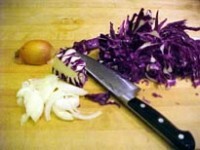 Add the cabbage, salt, sugar and apples, stir well and continue cooking. Add vinegar and the wine to the skillet. Cover and braise over very low heat, stirring from time to time, the cabbage is very soft, and much of the liquid has been absorbed, about 2 hours. Taste and add salt and pepper to taste. Serve warm, with roast chicken or pork. Trim the outer leaves and rough ends from each brussel sprout. Drop the brussel sprouts in a large pan of boiling salted water. Boil the sprouts until they are tender when pierced with a fork. Drain and refresh under cold water. Melt the butter in the same saucepan, and cook over medium-high heat until it turns a nutty brown in color. Add the brussel sprouts and toss to coat evenly in the butter. Serve the brussel sprouts when they are warmed through.